The UC Cooperative Extension is currently conducting a three-year study of springtime temperature inversion conditions in vineyard regions throughout Sonoma, San Luis Obispo and Santa Barbara Counties. This project has been funded by grants from the American Vineyard Foundation and the CDFA Specialty Crop Block Grant program. The purpose of this study is to quantify the temperature inversion conditions that occur during the springtime frost period, and to use this information to estimate the potential efficacy of wind machines for frost protection in these counties. With water supplies for sprinkler frost protection becoming less available in many areas, growers need to look for suitable alternatives. Improved information on inversion conditions will help ensure that industry investments in wind machines provide a predictable benefit. At select sites in each county, 35 ft. tall meteorological towers will be installed from March through May in 2012, 2013 and 2014. Temperatures will be recorded at the 35 ft. and 5 ft. heights on each tower throughout this period. Summary inversion characteristics will be compiled after the third season and then presented to industry. 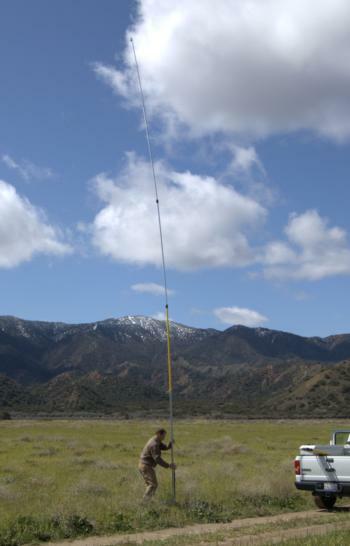 The 2012 season measurements were completed successfully, with towers installed at 68 locations throughout the study region, including limited measurements in Mendocino County. Study sites should allow for the measurement of representative temperature inversion conditions in the areas of the landscape where frosts typically occur. The sites must not be within the influence of active frost protection measures (sprinklers, wind machines, etc.) nor should they be located near significant physical obstructions such as buildings, hedges or tree lines which may influence air flow. An example ideal location would be an open field adjacent to a vineyard block, occupying a low-lying area where frosts have historically occurred. Other preferred characteristics for sites include easy access and security from potential vandalism or tampering. For an example of how this type of inversion information can be used, please see the December 2011 issue of the Grape Notes newsletter at this link.